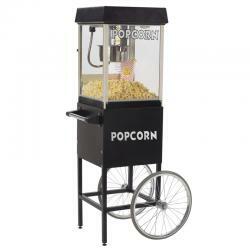 Main Category: Commercial Fun Food Equipment & Supplies | Color: Black | Hayes Specialties Corp.
Easy elegance that pops. This black 4-oz. popper stands out with its silver corner posts and signature E-Z Kleen Kettle. Add in the heated corn deck and heavy-duty storage cart on wheels and that's a recipe for a great midnight snack machine. Popper and #2949MD cart sold separately. Black dome. Makes 60 1-oz. servings per hour. Measurements are 18" x 16" x 24.5"